Endovenous Laser Ablation (EVLA) is a new minimally invasive method for treating large varicose veins that in most cases eliminates the need for open varicose vein surgery. It is a walk-in walk-out procedure performed under LOCAL ANAESTHESIA. It uses laser energy applied inside the incompetent vein to seal it shut. 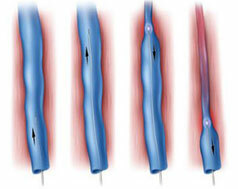 Once a laser-targeted varicose vein is treated by endovenous laser technique, the venous blood flow is re-routed from it to normal veins within the leg where it can effectively flow back to the heart and lungs. With EVLA, a small puncture is made in the leg and a laser fibre is inserted into the diseased vein allowing its treatment from inside the lumen. 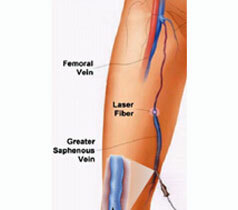 All large varicose veins are treated in one session in the same leg. This requires only micro-incisions and no skin sutures. The aesthetic results are excellent and only one hour after vein treatment, the patient walks out of the vein clinic and returns to normal activity the following day. A variety of laser wave lengths are in use for this procedure, including 810, 940, 980, 1064 and 1320 nm. The ELVeS* Painless 1470 Nm used with a new fibre design, the Radial* Painless. The Marbella Vein & Beauty Clinic in Spain is among the first vein clinics that are making this ultimate generation laser available for their patients. This system allows efficient laser vein surgery using very low laser power with virtually no side effects, no bruisinig and no pain. Microsclerotherapy / Foam Treatment Sclerotherapy / Foam Treatment. Ultrasound Guided Sclerotherapy.